Drug discovery has been focusing for some time on protein-protein (PP) associations, the basic molecular events in biology. The recruitment of protein complexes is required to initiate and propagate signaling cascades, regulate enzyme activity, articulate and control mechanistic processes involving molecular motors, etc. When such associations engage altered binding partners, complex formation may lead to deregulation of biological functions and the drug-based disruption of the aberrant associations may represent new therapeutic opportunities. However, the disruption of protein-protein interfaces (PPIs) remains a major challenge in drug discovery. The problem becomes daunting when the structure of the target protein is unknown and is further complicated when the interface is susceptible to disruptive phosphorylation. Based solely on protein sequence and on information on phosphorylation-susceptible sites within the PPI, a new technology was developed to identify drug leads to inhibit protein associations. The technology is described in the contribution “Drug leads for interactive protein targets with unknown structure” by Ariel Fernandez and Ridgway Scott, to appear in Drug Discovery Today. The novel technology is illustrated by a patented invention to treat heart failure. The success of this technology as implemented by Drs. Richard L. Moss and Ariel Fernandez shows that it is possible to generate drug leads in the absence of target structure. In cardiomyocytes, the myosin- myosin-binding protein C (MyBP-C) association creates a molecular brake on contractility imposed by the repressive activity of the unphosphorylated form of MyBP-C on myosin. In heart failure, MyBP-C is phosphorylated minimally or not at all due to down-regulation of β-adrenergic receptors. 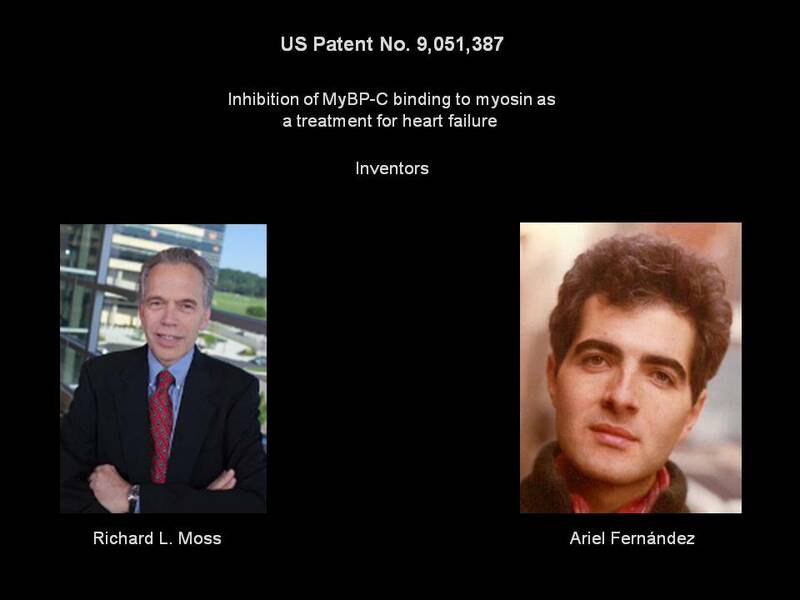 Since phosphorylation of MyBP-C improves contraction, US patent 9,051,387 proposed to target the phosphorylation site on MyBP-C with a pharmaceutical designed to disrupt its interaction with myosin and thereby improve cardiac function. This problem involves designing an optimal MyBP-C-derived peptide. The peptide contains the motif responsible for interaction with myosin and hence disrupts the MyBP-C-myosin association as required for therapeutic action. The myosin-binding peptide-based therapeutic agent may be identified based on the premise that disruption of the myosin-MyBP-C interface would release the molecular brakes on cardiomyocyte contractility imposed by the repressive activity of the unphosphorylated form of MyBP-C on myosin. The 3D-structure of the 11-domain MyBP-C is unknown, and therefore it was decided to design the peptide based on the output from a sequence-based predictor of native disorder. The peptide was developed based on a prediction of the dehydron-rich region that constitutes the putative myosin-binding site. To identify the peptide sequence, the inventors examined a region in the twilight zone between order and disorder. In this way, it became possible to identify the region containing the operational phosphorylation sites in cMyBP-C and determine the sequence of the patented peptide that may be used as a lead to the therapeutic agent to treat heart failure. The invention has been shown to significantly increase cardiac contractile force and frequency in the failing heart. Posted in Argentina, Ariel Fernandez, Ariel Fernandez Stigliano, Drug Discovery, Heart Failure, Pharmaceutics, protein structure, Protein-Protein Association, Richard L. Moss, Wrapping Technology.Tagged Ariel Fernandez, Drug design, Heart Failure, Richard L. Moss. Previous Post Crisis of Trust in Science: How Much Out There is for Real?